What is an El Niño, Anyway? 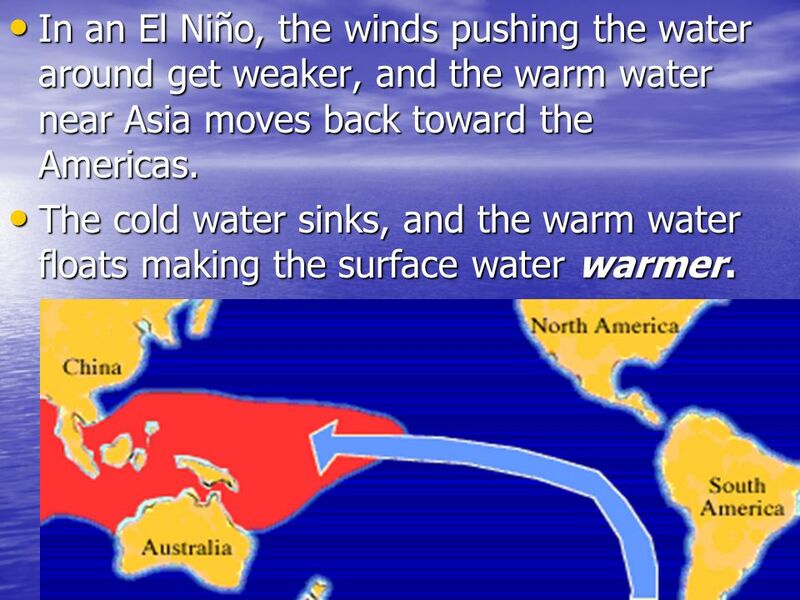 1 What is an El Niño, Anyway? 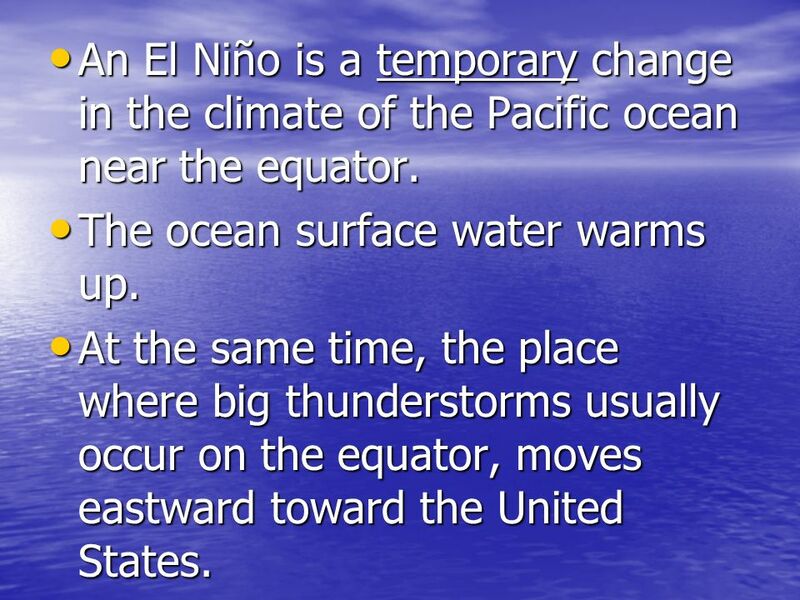 2 An El Niño is a temporary change in the climate of the Pacific ocean near the equator. The ocean surface water warms up. At the same time, the place where big thunderstorms usually occur on the equator, moves eastward toward the United States. 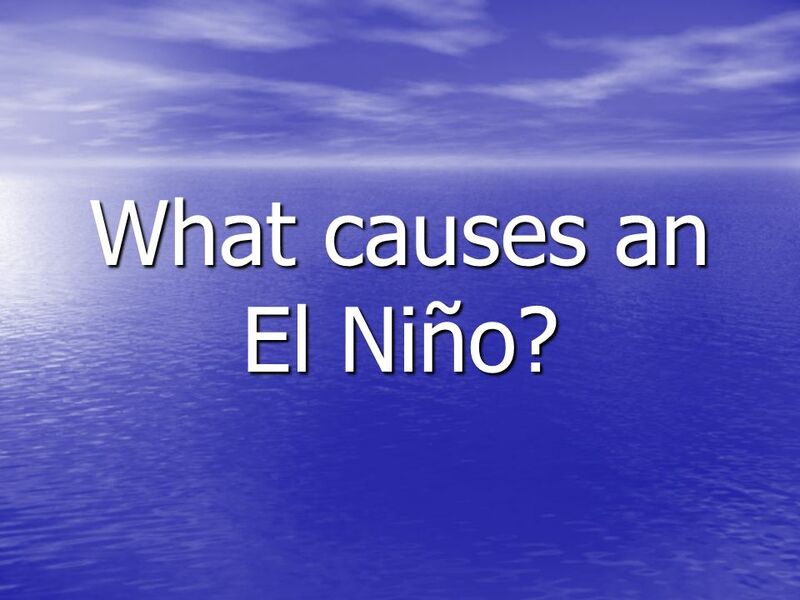 4 What causes an El Niño? 7 In an El Niño, the winds pushing the water around get weaker, and the warm water near Asia moves back toward the Americas. The cold water sinks, and the warm water floats making the surface water warmer. 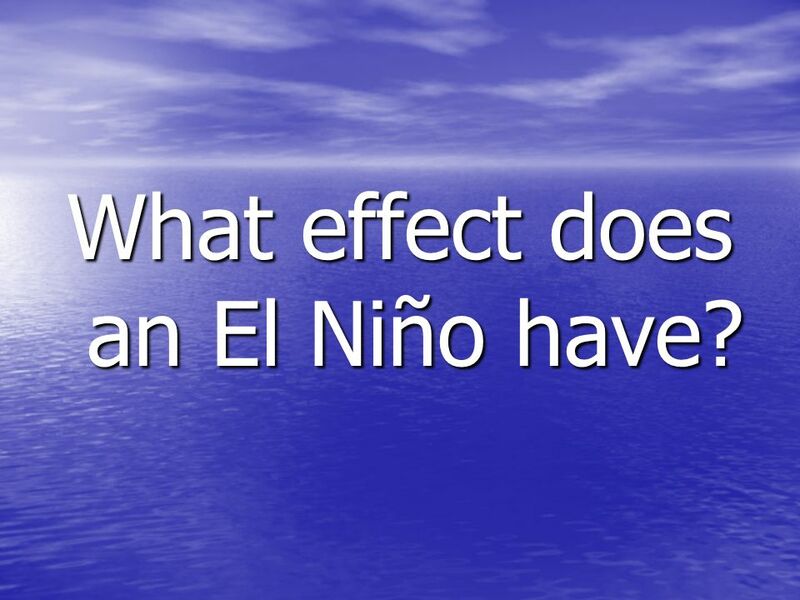 9 What effect does an El Niño have? 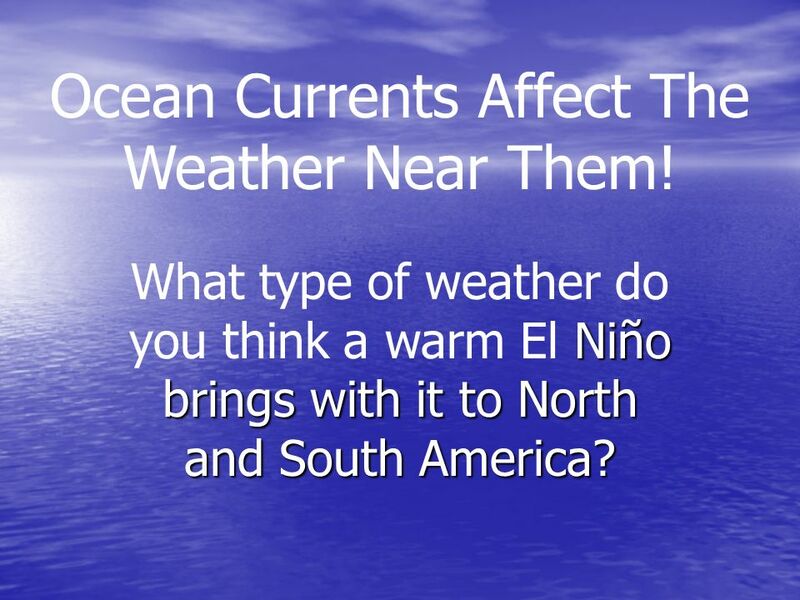 10 Ocean Currents Affect The Weather Near Them! 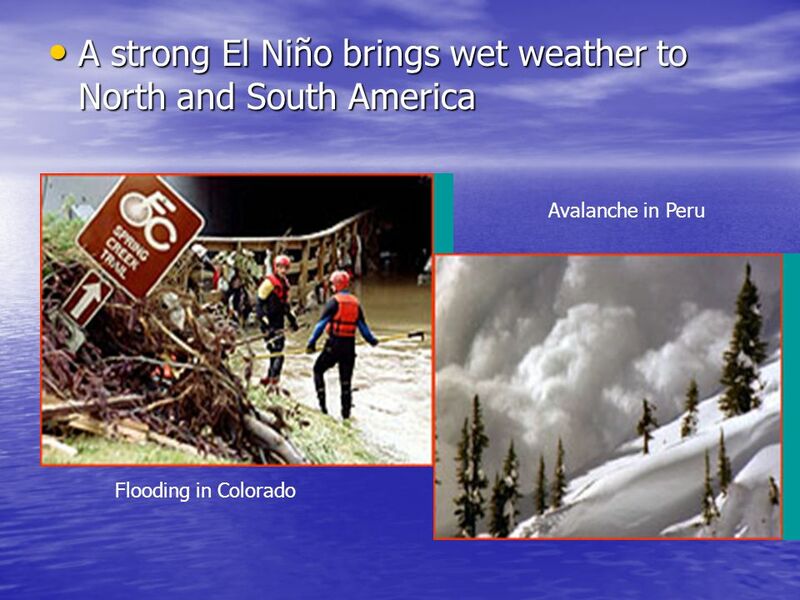 What type of weather do you think a warm El Niño brings with it to North and South America? 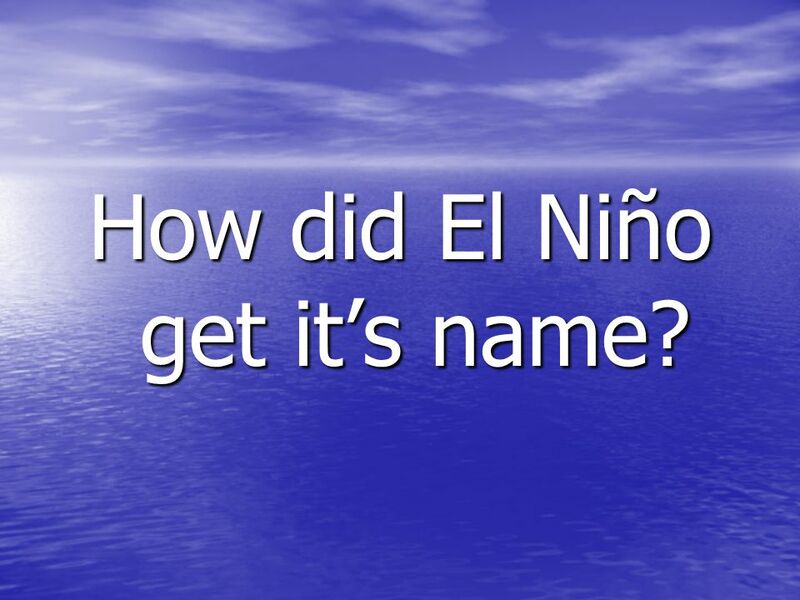 12 How did El Niño get it’s name? 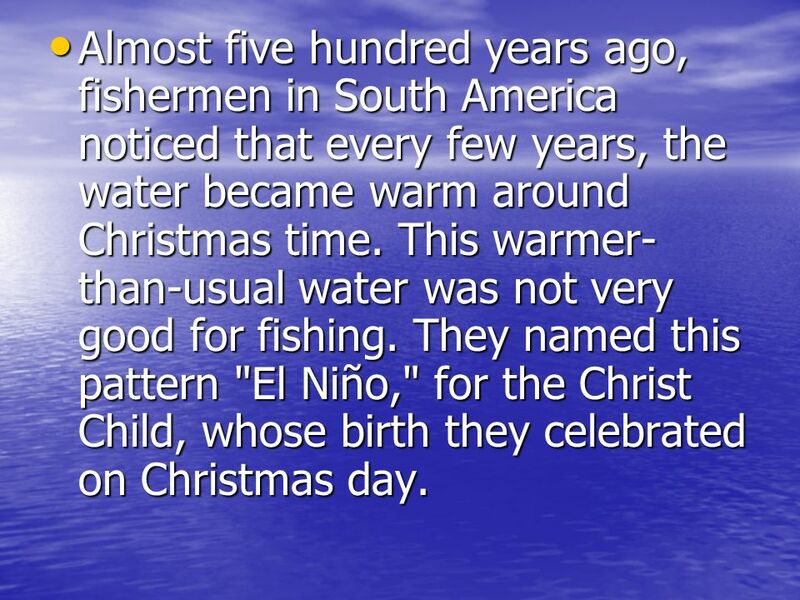 13 Almost five hundred years ago, fishermen in South America noticed that every few years, the water became warm around Christmas time. This warmer-than-usual water was not very good for fishing. They named this pattern "El Niño," for the Christ Child, whose birth they celebrated on Christmas day. 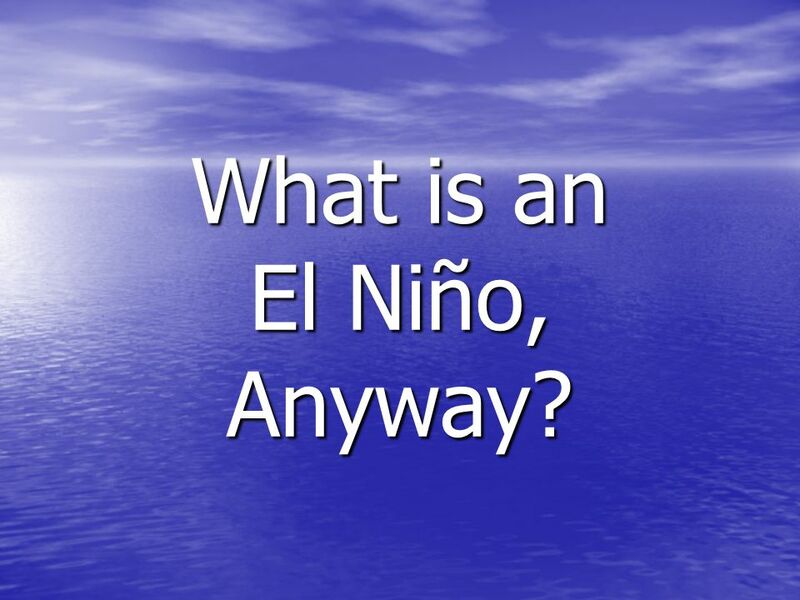 Download ppt "What is an El Niño, Anyway?" Increased Storm Activity around the Globe. 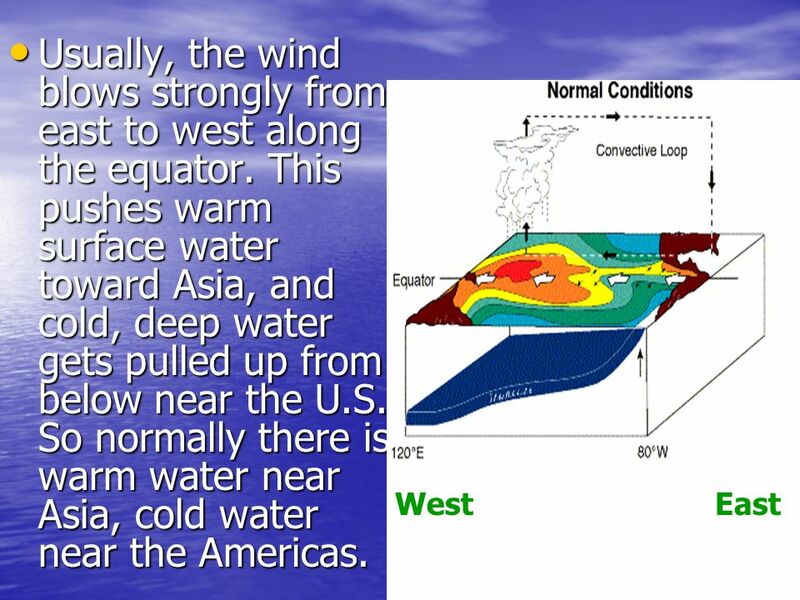 Blow to the west across the tropical pacificTrade winds blow to the west across the tropical pacific Winds pile up warm water in the west pacific so the. El Niño. What is El Niño? A shift in ocean current direction and water temperature El Niño: the ocean part: Warm phase of ENSO: El Niño - Southern Oscillation. El Niño & La Niña. 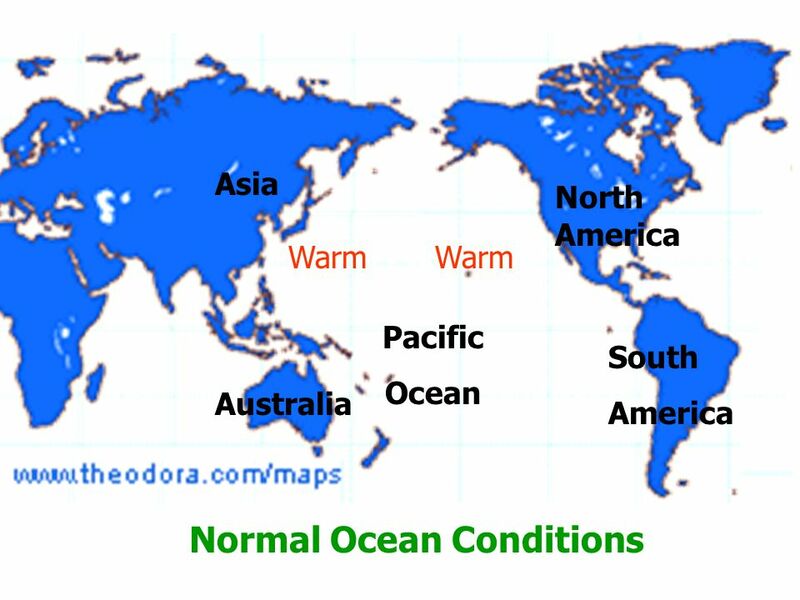 Vertical temperature change ● Temperature – there are 3 temperature zones in the ocean. ● Surface to 200 meters – warmed by the Sun. ● Thermocline: 200. Shanese Breitkreitz. Meaning – La Nina  The little girl  El Viejo – Old Man  A cold event  A cold episode.  Currents are steady, smooth movements of water following a specific course.  They proceed either in a cyclical pattern or as a continuous stream. Chapter 13 Oceans. 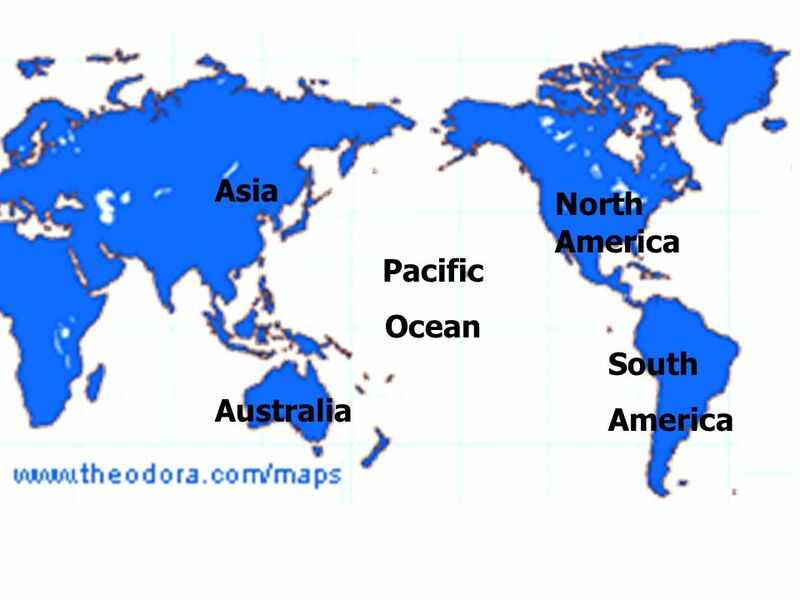 Chapter: Oceans Table of Contents Section 3: WavesWaves Section 1: Ocean Water Section 2: Ocean Currents and ClimateOcean Currents. 1 10 pt 15 pt 20 pt 25 pt 5 pt 10 pt 15 pt 20 pt 25 pt 5 pt 10 pt 15 pt 20 pt 25 pt 5 pt 10 pt 15 pt 20 pt 25 pt 5 pt 10 pt 15 pt 20 pt 25 pt 5 pt Surface. Ocean Currents “Rivers in the Ocean”. Currents Current – a large stream of moving water that flows through the ocean. Capable of moving large amounts. El Niño Subtitle. What you need today: Pencil Bellringer sheet Binder Everything else on the counter. Bellringer # 1 What have you heard about El Niño?